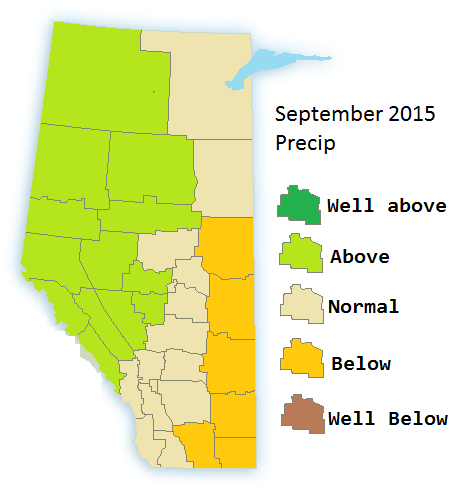 After a rainy and cool September the warm and dry weather is already beginning to return. As we go into October the effects of the super El Nino of 2015 will only get stronger, thus a bias toward warmer and drier weather. Currently the last 3 runs of the CFSv2 have been consistent with very high temperatures around Thanksgiving, around 18-22c at the 850mb level. 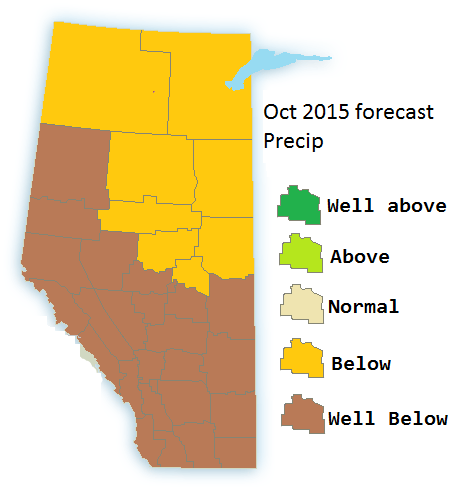 Overall October 2015 will be warm and dry over most of the province. Expect a higher than normal variability due to the effects of the El Nino, so bitter cold should be noted especially in the north-eastern parts. 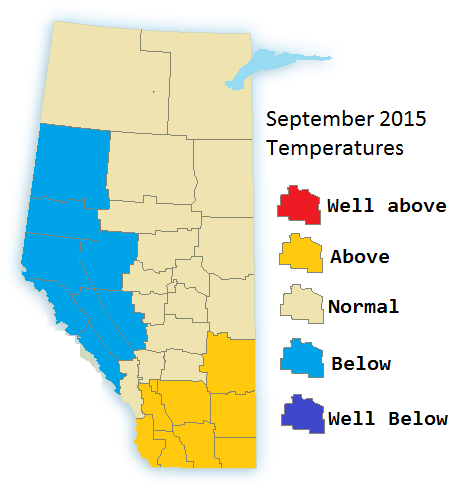 Oct 1-10: Beginning warm turning to colder and drier. Oct 10-20: Heating up around thanksgiving, temperatures potentially reaching the mid 20s or higher. A sharp drop afterwards and remaining cooler. Oct 20-31: Warm and dry, Severe wind storm risk higher than the norm. Note: forecasting weather in advance is not easy, We take into effect multiple model runs, existing conditions, and larger scale patterns to come up with a forecast. 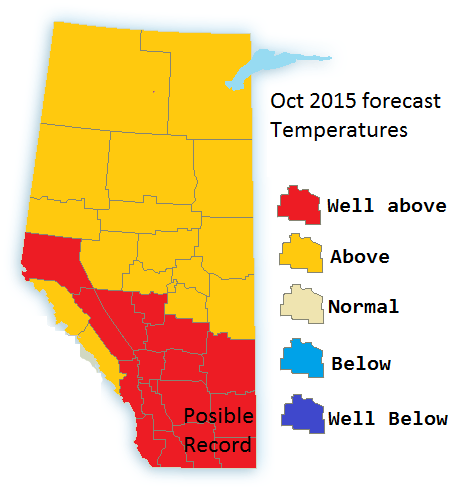 Fall 2015 Forecast from AlbertaWX! The hot and dry pattern since March will only end “briefly”. A wetter and cooler September should offer a short break before warm and dry conditions return late in the month or early – mid Oct and likely to last toward the new year. 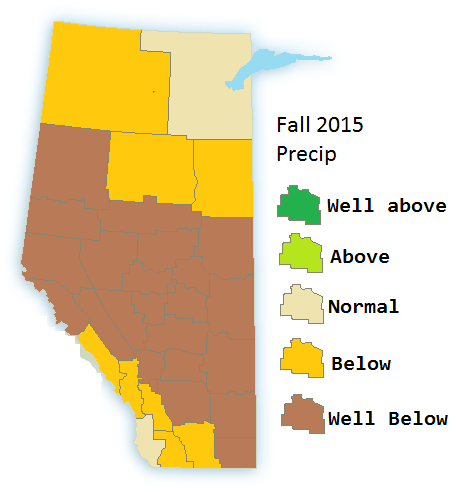 Overall Fall 2015 will be warmer and drier than normal over much of Alberta. September will likely break a chain of hot months as only the south-east part of the province should be much warmer than normal and the Western part being cooler than normal. Likely it will seem like winter comes early but after that it is likely to go in reverse. While the additional rainfall/snowfall is welcome during the drought it is badly timed. A special note is with the combination of cooler than normal temperatures and above normal precip at this time of year means the risk of tree damage due to heavy snow. This risk would be in the western and north western part of the province. October: The colder and wetter pattern should once again be replaced with a warm and dry pattern by the start of the month. dominating much of the province. November: The warm and dry weather will continue and strengthen, due to persistent drought conditions and a higher chance of strong Chinook events like the ones seen in 2012 dust storms should be noted as a risk over much of the open regions of the province. The fire risk will also run quite high for much of Alberta.